World No.2 Andy Murray became the first British man in 77 years to win a Wimbledon singles title after beating World No.1 and top seed Novak Djokovic 6-4 7-5 6-4 in the final at Centre Court of the All England Club in London on Sunday. 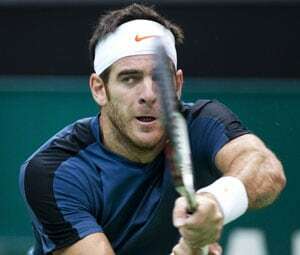 The top seed Serbian was favourite to lift his seventh Grand Slam title but he was made to sweat by the World No.2 of Great Britain from the very start of the match. 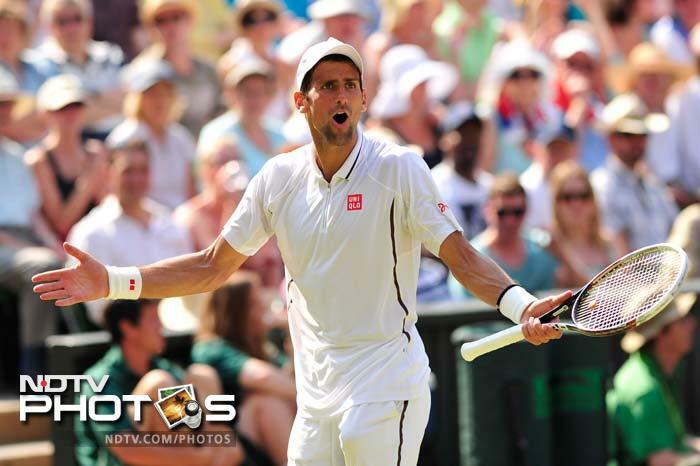 Djokovic saved three break points in the first game of the match and the road ahead for him became tougher and tougher. Djokovic slipped and turned and fell more than once in the first set itself, making him vulnerable and unsure of usually solid baseline play. Murray dominated the first set and went onto claim it 6-4 in 59 minutes. The start of the second set saw Novak Djokovic showcasing his brilliance in the first half till he gained a 4-1 lead with two breaks of serve. 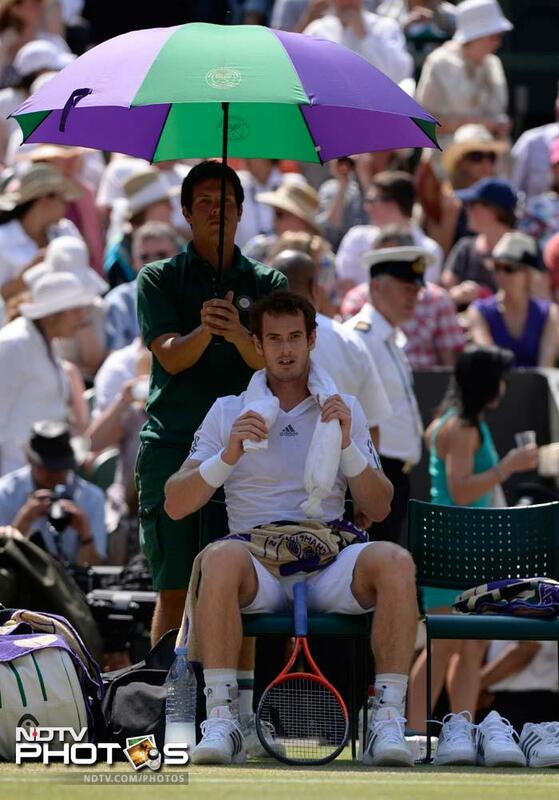 But that's when Murray just stepped up his game a notch. Murray then fought back stunningly to break Djokovic's serve thrice more in the second set to claim it 7-5. 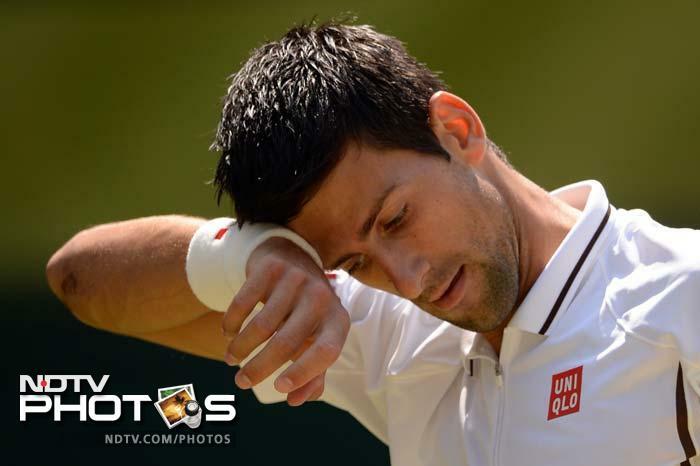 Not much was going for Djokovic as he had lost all his challenges before the second set ended. More than Murray it was Djokovic who was being stretched to the limits and for a change his 'elastic' reach to the ball was not enough for him to gain the upper hand over a solid Murray. 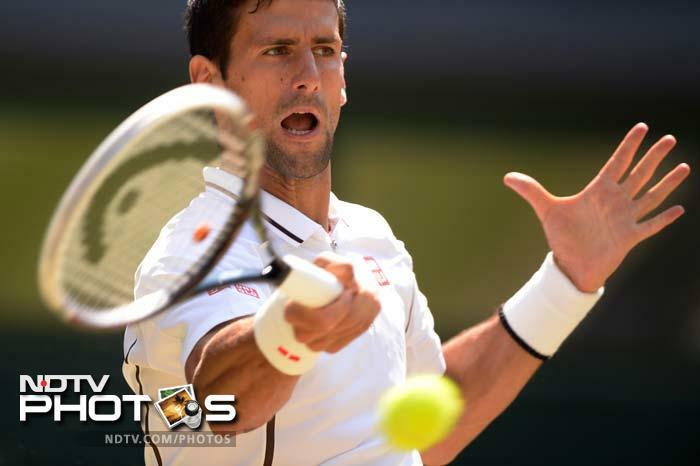 Despite losing his serve early in the third set, Djokovic did try and match Murray shot to shot in the third set. 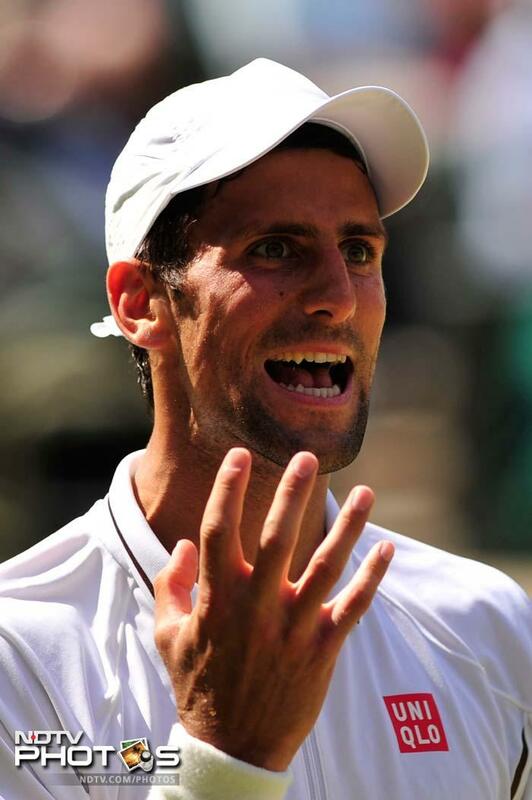 However, often due to his unusually high percentage of unforced errors, Djokovic was left to admonish himself on most occassions. The Serbian lost his cool many times during the match. Murray did feel the heat though, not from Djokovic, but from the glazing sun which affected his serve at times as he had to look straight into the sunlit sky. At 4-4 in the third set, Murray won two consecutive games to clinch the tie 6-4 7-5 6-4, completing the third set in 61 minutes. 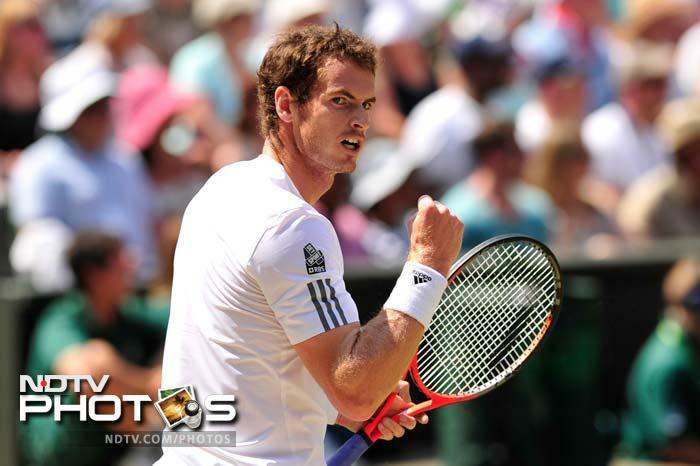 It was 'shock and awe' for Murray and all of Britain as he beat the tournament favourite in straight sets. 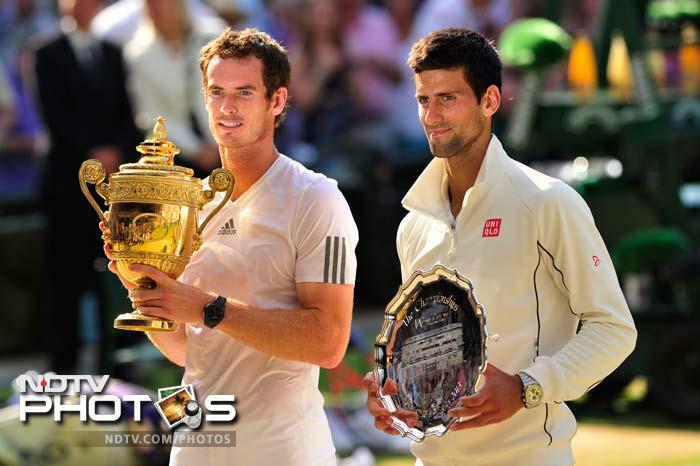 Statistically speaking, Murray was far superior to Djokovic, having fired 9 aces as compared to his opponent's 4. 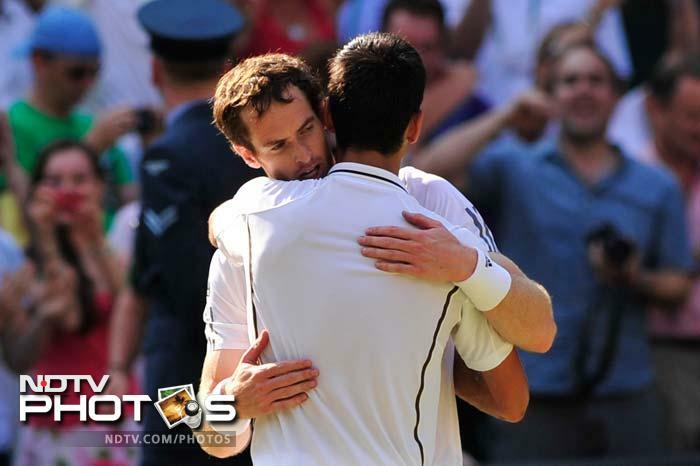 Murray had 72 per cent points won on the first serve while Djokovic had 59 per cent success. Djokovic almost doubled Murray's count of 21 unforced errors with 40. Murray was brilliant at the net as well, winning 70 per cent of the points as compared to Djokovic's 58 per cent success close to the net. 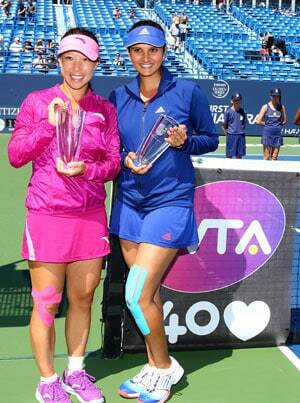 Murray finally clinched the coveted title, something that had eluded Britain for the last 77 years. The last British tennis player to win a men's singles title at SW19 was Fred Perry in 1936. A victorious Andy Murray, Wimbledon's new champion and Britain's hearthrob, waves to his fans from a walkway after beating Novak Djokovic in the final at the All England Club on Sunday.